How are Your Follow-Up Sequences Working? Welcome back again to our agent referral blog. I built this to stay in contact with all my great friends in real estate and to share with you what has been working for our team. Today we are going to talk about the fortunes in our follow-up process. For every 100 leads we get, only about 5 of them are people who want to buy in the next 60 days. The other 95 aren’t buying for at least 60 days. 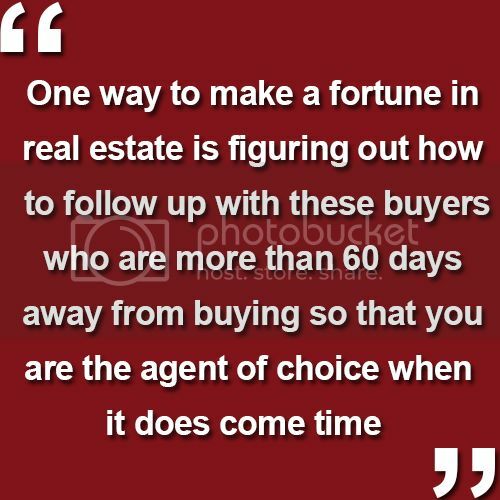 One way to make a fortune in real estate is figuring out how to follow up with these buyers who are more than 60 days away from buying so that you are the agent of choice when it does come time. We came up with a system for our leads. Anybody who is buying in the next 60 days is what we call a hot buyer and we immediately assign a follow-up sequence to them that will contact them almost every day. The next category is our nurture category. These are the buyers who are not buying in the next 60 days, but are buying in the next 6 months. We assign a follow-up sequence for them, too, but only contact them about once a week by phone and once a week by email. Finally, we have the watch category for people who aren’t buying for at least 6 months. We believe 2 calls and 1 email per month is plenty for them. Thanks for joining us today. We hope these work for you. Remember, we are now serving the entire state of Arizona and would love your referrals. If you know somebody coming to the area, reach out to us!